I have been wanting to make this pattern for a long time but could never quite decide on the right fabric. I don't think I've used the right fabric in this version though, because even though the cotton sateen has the right amount of body and stretch to make it fit really well the busy print hides those special details. I think I will make this again in a solid colour, perhaps with a contrast collar and pocket to make those details stand out. This dress wasn't that easy to make and it took longer than I expected. While there wasn't any particularly tricky sewing involved, just figuring out the pattern took a lot of concentration. 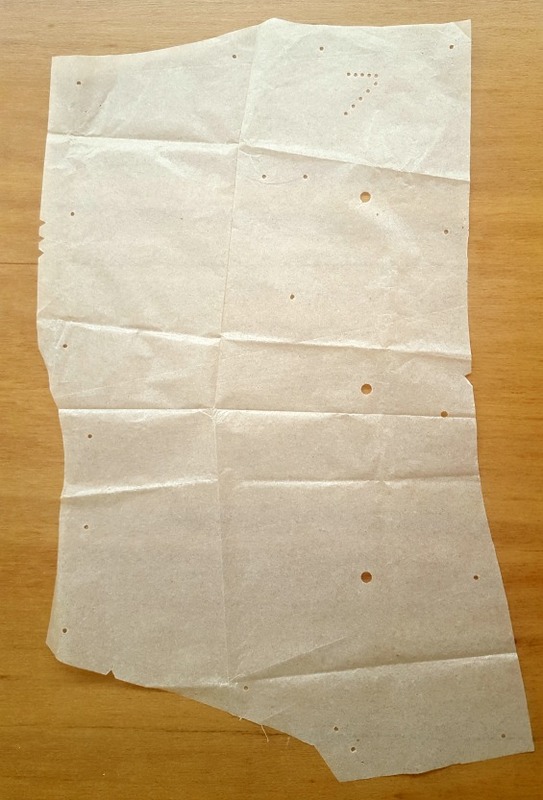 It's one of those very old patterns that have no printed instructions, but rather perforated dots of various sizes that you need to connect and figure out the connections. 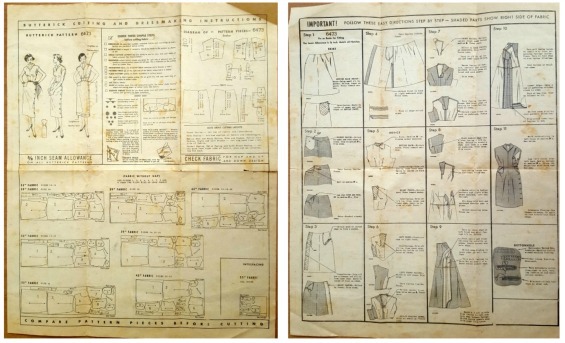 And for all my complaints about the brevity of Burda instructions, this pattern is just as bad. One page of instructions, and one page of fabric cutting layouts and then you're on your own to muddle your way through. The pattern incorporates an extension to the left side of the bodice and the skirt that gets folded under to form a facing for the buttons which I didn't need since I just used an invisible zip. Which meant I had to cut a few inches from the side seams and sew the side seams a few times to get a close fit, but got there in the end. No swayback puddle of fabric and only a few wrinkles emanating from the armpit which is to be expected with cut on sleeves like these. Overall I'm really pleased with this project. Not only did I use a fabric and a pattern that I've been meaning to use for a long time now, but I also got a very cool dress that is perfect for the still very hot summer weather we're having. 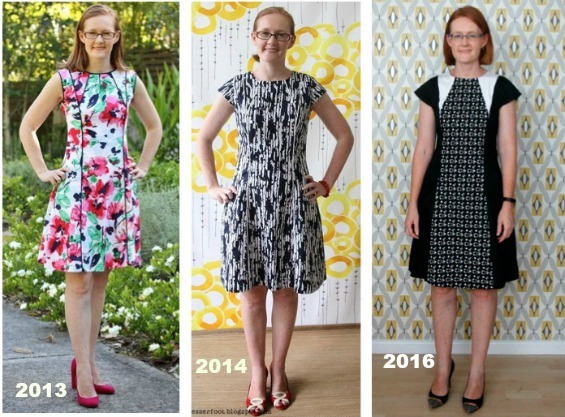 And in a great coincidence there happens to be a red dress contest running over at Pattern Review that I will enter, if any of you would like to vote for me! 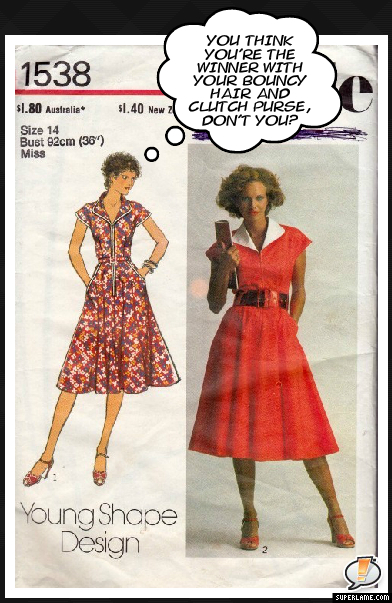 Today's post is brought to you by heat wave conditions here in Sydney, a winter-ish issue of Burda and scratchy polyester fabric - in other words I have suffered for the sake of this post. However it was worth it to record the fact that I've made my February Burda of the month project in the month of February - that's 2 out of 2 this year so far, yay for me! 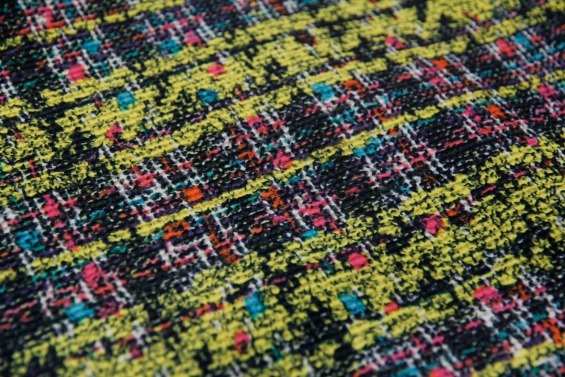 My fabric is pretty cool in terms of colour though - neon yellow and pink, with sprinkles of blue and orange for good measure. It has a tweed like texture, although it's only a print and not a woven. 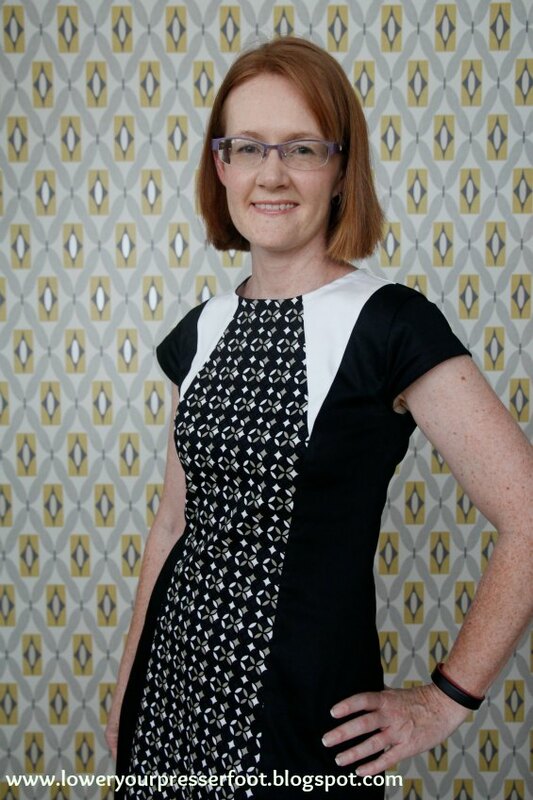 I recall this fabric popping up on a few Australian bloggers in recent years, including this dress by Top Notch from 2014, so when I spied it on the clearance table at Spotlight recently for the princely sum of $4/m I snapped up a few metres for myself. The colour may be great, however the feel and texture is not so great. It's polyester/spandex, and it feels a bit like plastic bags woven together - a bit coarse and stiff but with four way stretch. However the stiffness was perfect for this style, as fabric with some body is required to make the collar stand up properly and not collapse. The collar is a straight piece cut on the bias and folded in half. I couldn't add any interfacing because some stretch is needed to ease the collar to the neckline, but luckily this fabric was stiff enough to work without interfacing. 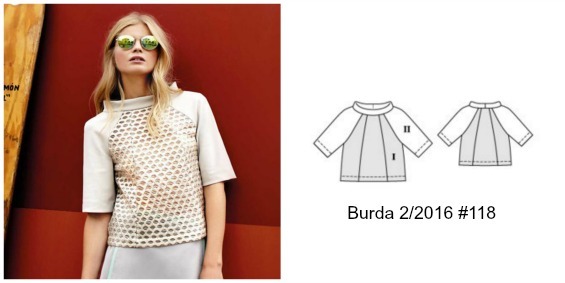 Overall, another great pattern from Burda. It was very quick and easy to make because it's just a simple raglan top, but I think those seam lines and the stand up collar make it a little bit different. 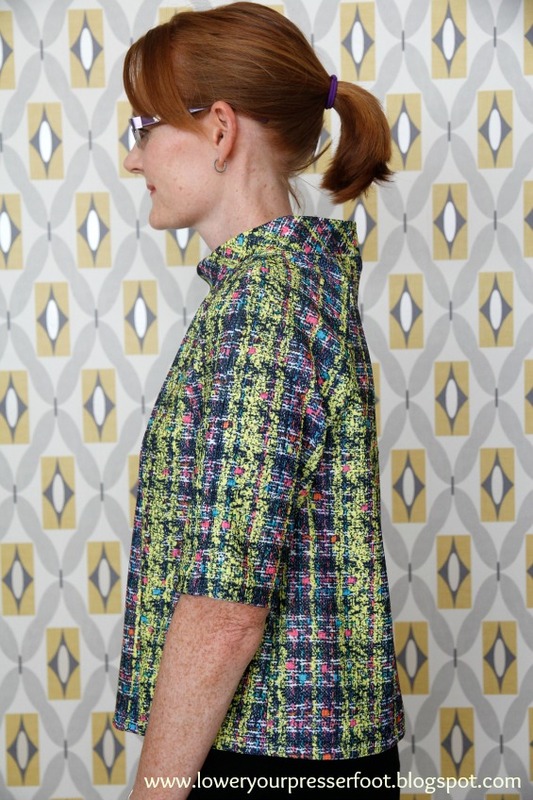 Now if only I could find a fabric like the one used by Burda, I would make another version of this top in a jiffy! 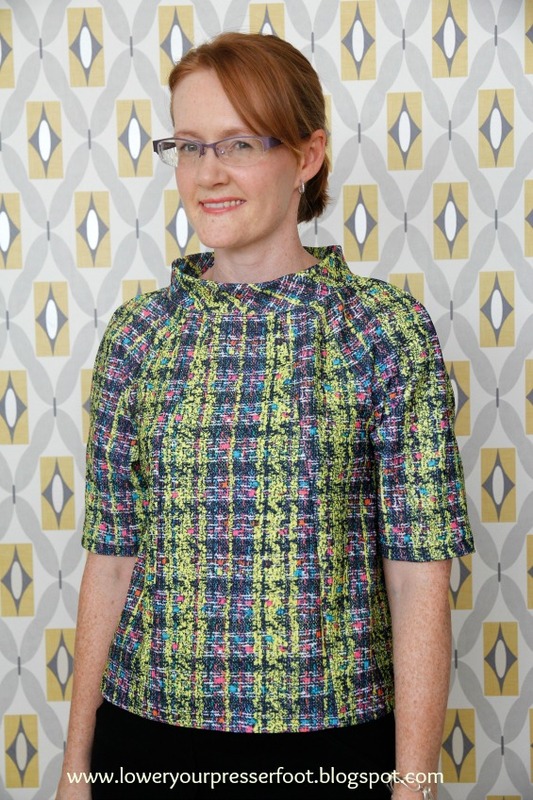 After having Vogue 2783 in my pattern collection for many years unused, I've now made this pattern three times in last few years. I don't know why I left it so long before I used it in the first place, because it really is a great looking dress. It's now OOP, but it is available through some Etsy and Ebay sellers. The first version I made in 2013 (posted here) is made from a floral cotton sateen with dark blue piping. The second version I made in 2014 (posted here) is from a cotton/linen in a graphic print with white piping, and little cap sleeves. For the third version I chose to keep the cap sleeves but not to use any piping, and instead use contrasting fabrics. All three dresses look quite different don't they? How funny that since 2013 my hair has gotten shorter and my hemlines have gotten longer! 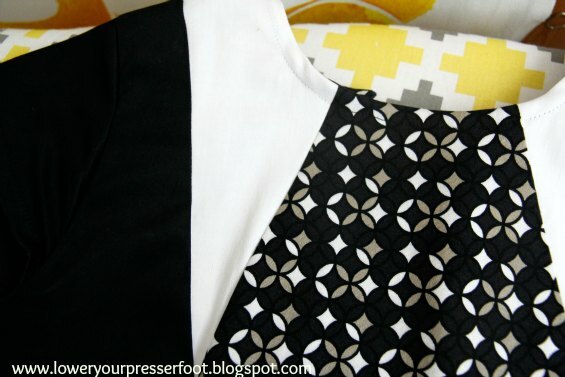 The fabric I've used in this version is a printed cotton drill I bought late last year from Tessuti, and cotton sateen in black and white bought from The Remnant Warehouse recently (and specifically for this project). 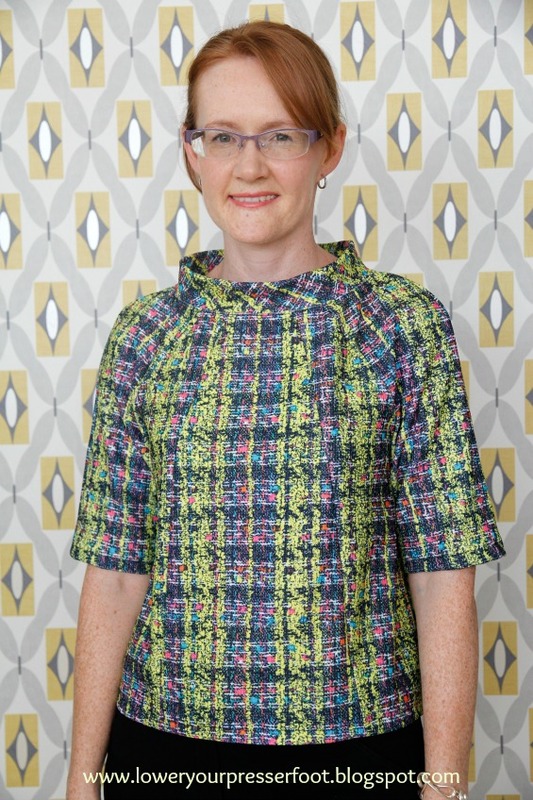 I bought two metres of the print cotton drill planning to make an entire dress from it, but I think it looks more striking mixed up in this way. Plus now I have some fabric left over to make something else since this didn't use much - bonus! After suffering quite a bit of disappointment lately with cotton sateen (wrinkly, sagging out or losing it's dye easily), I have to say that the quality of the cotton sateen from the Remnant Warehouse is great. It's about the same price as that from Spotlight but it's much thicker, hardly wrinkled after a day of wear and didn't lose it's sheen after a wash. I don't know if it will stretch out because this isn't a fitted dress, but I bought several metres of the black intending to make some pants, so I guess I'll find out soon enough! Construction wise there isn't too much to say - the pattern runs terribly large, but I had already made changes to the pattern from the previous two versions so I was able to sew this up quickly. Instead of piping around the neckline I used bias tape to finish the neckline and armholes, and as you can see in the photo above I used white thread on the white portion and black thread on the black portion for the topstitching - how is that for attention to detail? I do like the fit on this dress, but if you are planning to make this pattern just beware you'll have to take it in a lot to get a close fit. Despite my measurements indicating I should make a size 12, I use a size 6 pattern and still have shaved a few centimetres off each pattern piece above the waist. I also chose not to make the matching belt, because without a waist seam I don't think it really needs to be worn with a belt. I also left off the bottom band because I would need to significantly shorten the dress and I thought it would interfere with the strong vertical lines of the dress. Keeping it simple I think is more effective with this pattern mixing instead. So overall, I really like this dress and if you have this pattern I can highly recommend making it. 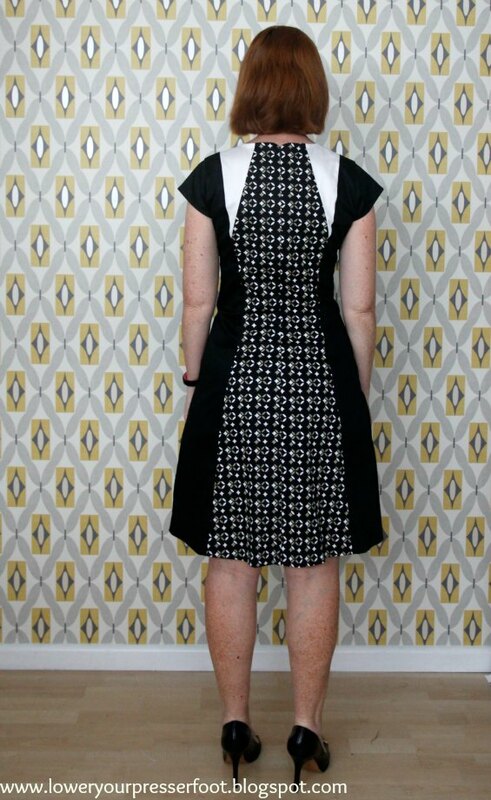 But after three versions, and with so many other dress patterns in my collection I think this one may be the last. Check out the evil stare that the illustrated lady is giving the real life lady on that pattern envelope! Nothing to do with anything, but I thought it was quite funny and worth sharing. So the winner of the pattern give-away is.....well, the winner is actually me and anyone else who ever thought about irons - so much good advice! Thanks to everyone that pitched in with their experience, it is all very useful. I haven't actually made a decision yet, because I plan to go into the store and actually handle the irons as Jessica Malcolm suggested, instead of just relying on technical data and reviews. I'm still tossing up between the Philips or Tefal though, because the Laurastar irons are a bit out of my budget and I don't think the Rowenta irons or Maytag are sold in Australia. I am leaning towards the Tefal though, because like a few of you I have dropped my current one several times and it is still working. Also, I love how Sofie M and Heber were having a running conversation in the comments about the iron Heber received from her boyfriend - too funny! 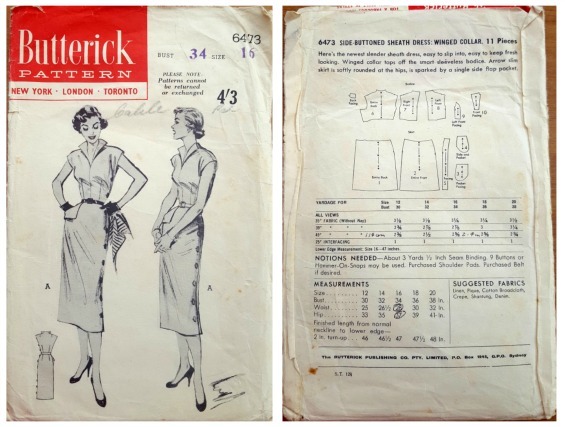 And thanks to Melissa Lee for answering the question about which pattern I was referring to when I said there was a modern copy of the 70s wrap skirt pattern - I was trying to be diplomatic and not name any names! If you could all email me at KristyLChan@outlook.com with your postal addresses, I'll get them out to you shortly. A big thanks too to Melissa Zillman who not only very kindly emailed me with advice on the Philips iron but even attached photos of the spluttering marks left on her jeans after ironing - I so hate it when that happen. And a special mention goes to Mike Dunlap - I think you are my first male commentator ever!